For the ceremony on 30 April in Aubagne, the designated carrier of the “hand of Captain Danjou”, the “le porteur de la main du capitaine Danjou” will be Chief Medical Officer Jean-Louis Rondy. In this way the Legion will honor the French Army Health Service and the way in which it cares for wounded soldiers and legionnaires. At 17, in 1943, Jean-Louis Rondy participated in the liberation of Paris and served in the ranks of the Leclerc Division (French 2nd Armored Division) in the campaign of France and Germany. After the war, he resumed his studies and was admitted into the French Naval School of Medicine (the Santé Navale a civil-military medical school). Appointed doctor-lieutenant in 1952, assigned to 1BEP (1st Foreign Parachute Battalion) of the Foreign Legion, he joined the fight in Tonkin. He participated in operations in the Delta and made the fateful jump onto Dien Bien Phu on November 21/22 1953. He is wounded and captured on May 8, 1954 and held prisoner for four months until he was repatriated and then hospitalized for almost a year. He served again in the Foreign Legion, as medical officer at 3REI (1965 – 1967) in Madagascar, during the events in the Comoros. 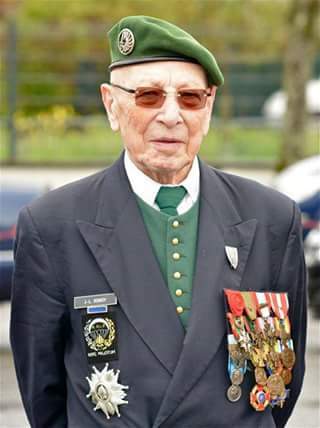 –Another veteran who will be present at the ceremony will be 91 year old Frencis Ruiz. A former member of the Foreign Legion who joined when he was 16 years old in 1944. In 1950 he was sent to Indochina to serve as a Sergeant-Chef in the 1BEP. He fought in the battle for RC4 (Colonial Route 4) in October 1950 and was captured by the Viet Minh and held prisoner until 1952. Note: More to follow this week.